Now I am enjoying my 1st day of retirement, then of course the mind turns to the Moke. Faye (maybe) and I are thinking of doing some longer trips in M-ute and this most likely will including camping although I doubt there will be many bush camps. Should we invest in some sort of trailer camper or modify the back to accommodate the extra space and load needed? ? To add a frame and soft sides to the existing back tray is no big task however the current weight with 20l fuel is about 770kg. A possible problem with towing is the extended tray and the reduced distance between where the tow connection would be and the lowest point of the tray where the number plate is mounted. I have always liked the idea of a fifth wheeler on a Moke so maybe a pivot point in the tray and then a drop deck trailer with a double axle running mini wheels. Plenty of room for sleep and carting stuff. If you are not planning on bush camping then just having a raised soft cover on the tray would be enough to keep a few things dry so that can carry things to your cabin. If you are wanting something to sleep in then a light trailer with a long draw bar could work. I have one 90% completed for the Perth trip that was an ex-Double-Jetski trailer that has a long extendable single drawbar. I am thinking of finishing it off to take to Bathurst. You don't really want to put too much weight in the tray, unless maybe you can do something with the suspension. 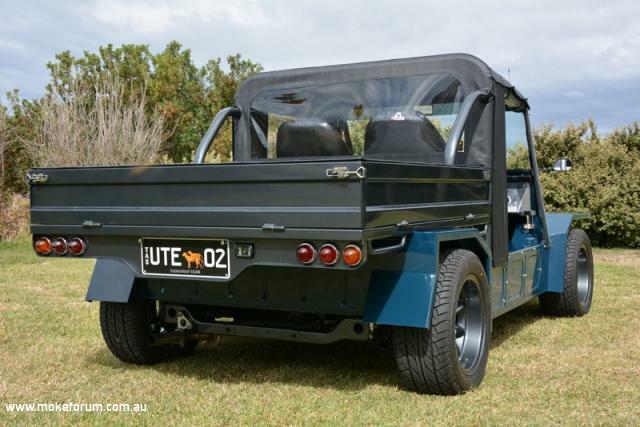 The Factory Moke utes only had a payload of around 220kg. I built a flat tray for my previous Moke many years ago. Once, by mistake, I had a 1/3 cubic metre of blue metal loaded into it. It would have weighed about 500kg. I could turn the steering wheel with one finger and the exhaust pipe hit a manhole cover on the way home. Not recommended. By contrast the towing capacity of a Moke is somewhere around 400kg (opinions vary) so it still won't be easy to find a camper trailer in that size. Driving a Moke with a hardtop is like having a shower in a raincoat. Now that you have plenty of time you & Greg should be able to come up with the ultimate moke camper. the tent via a room at ground level. material and not heavy canvas it shouldn't weigh too much. If you are staying at one place for a few days the camper can be un coupled from the moke and left on site. I haven't done anything like the adventurous Moke travelling others on here have, but I've done a fair bit in 4wds, both with and without a camper trailer. As well as difficulty finding parks outside of lace shops (certainly not arguing that's not a major issue) the other very noticeable inconvenience when towing a trailer on your travels is that I've been up more than a couple of tracks which were supposed to be passable until I came across a bogged vehicle, flooded crossing, or tree across the road. Backing up or turning a 4wd with an off road camper hooked up in this sort of situation has been very challenging at times, but in pretty much every case I can remember it would have been next to impossible without assistance in a Moke with a trailer. I'm not talking about 4wd tracks by the way, more like your standard National Parks or beach type tracks. In theory, you set up your camp (drop off trailer) and then head on up as many tracks as you like. In reality though, that's not always convenient. Budget... I didn't know anything about a budget... I must have missed that memo. back in 2011 yella terra had a tear drop camper for sleeping ,cooking or base camp worked well. camper weight was 285kg. 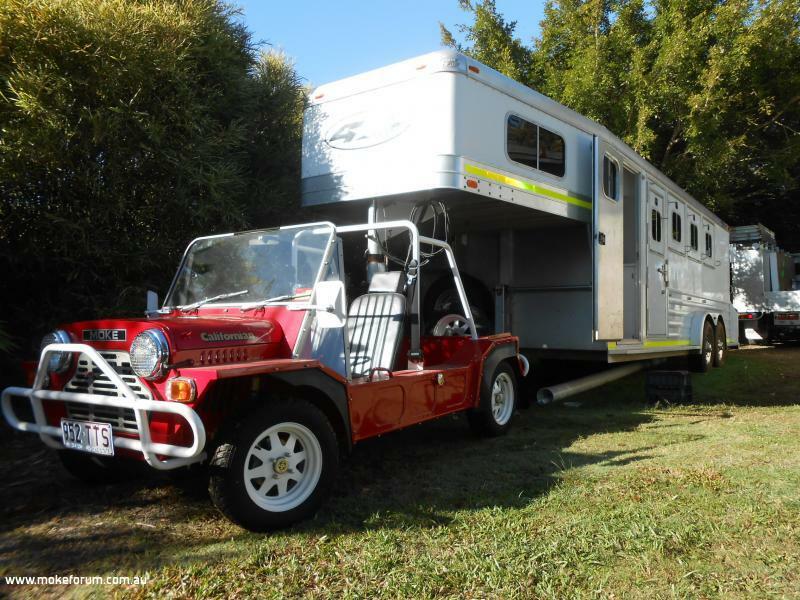 If you can wait until Bathurst, SparkiMoke will be there with his teardrop caravan behind his Moke if you haven't seen it. Terry -- Re your 5th Wheeler idea - something like this ?? That unit doesn't have Mini, or Moke, wheels but otherwise pretty much nails it. If Mrs Moke My Day is travelling she will be happier in the above than a tent. Wow Rod, firstly congratulations on your retirement. I'm sure weight will be on your mind but with the quality of M-ute, would it be possible set up the tray to take a lift/clip in camper, like a roof top one. Then also get Greg to build a small trailer that the same camper sits in and tows behind. Then this trailer can double as a small box trailer when needed at home. You could test it around Tassie and see which option works best. If you make a roof top or back ute camper it will cost less on the boat over. Thanks all for the feedback and the retirement good wishes. No retirement for Faye however Shorty someone has to make a few $$ to fund our trips. Terry the fifth wheeler appeals to me, always wanted to be a truck driver. I will check out what fronts at Bathurst in October. Plus I have lots of photos from other trips, have always thought Woody's was the ideal setup. Moemoke I think your approach has the best chance as builder Greg is not keen on the trailer idea and he controls the manufacturing process. I was backing a tractor and trailer as a kid long before Greg was thought of however in recent times that skill seems to have been lost so Newie your thoughts will rate high with him. Pete getting a bigger car is one that many (non Moke) people have suggested as I have a VE Ute but you don't get the same smiles from people as you drive down the roads. And Shorty your reference to the boat cost I think will be the decider. Faye has indicated that a few nights maybe okay in a tent as long as cabins/motels are also part of the accommodation options on any trip. Looking at the Oztent, build up a frame for the back so that the camping gear is on top of that and the current cabin. The one problem with that is the current bars that go from the rollbar down to the tray.